Poker is a game which many people play, but in which few excel. To be successful requires a great deal of work and study, and a deep understanding of those concepts that govern winning play. Yet it is fairly easy to win at poker. All you need to do is learn to play tight, and stick to easy games -- usually those prevalent at the low limits. But there is a problem. While this is a winning formula, it won't allow you to do much better than minimum wage. But there are a small number of players who do much better than this. These are the experts who have mastered the proper skills and have done their share of thinking. This text contains those essays the author wrote from 1996 through early 2001. Topics include: General Concepts, Technical Ideas, Strategic Ideas, In the Cardrooms, Hands to Talk About, The Ciaffone Quiz, and Two More Quizzes. In addition, advice is offered on which game to play, controlling steaming, marginal hands, selecting the best game, bluffing, unusual strategies, raising with suited connectors, keeping poker honest, reading hands, checking aces, and much more. 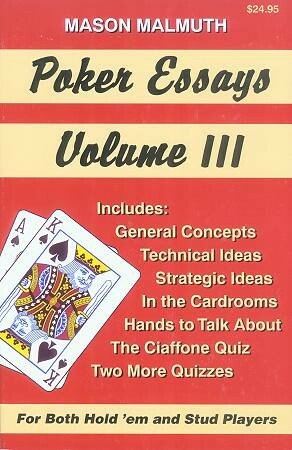 As with the first two books in this series, Poker Essays, Volume III is designed to make the reader do a great deal of thinking. In fact, very few readers will agree with everything this text offers, but the information provided should help most people become better poker players.